Scaling down its supernaked Z range to be compatible with A2 licence holders was a big risk for Kawasaki. It could so easily have ended with a machine that offered some of the looks but none of the fizz that it’s bigger engined fast roadsters do so well. Yet, this is Kawasaki and they have a knack of bringing an endearing bit of bonkers to any class they compete in. That won’t stop plenty of riders pointing out the Z300 is down on power compared to the likes of the KTM Duke 390, which offers 43PS to the Zed’s 39PS. 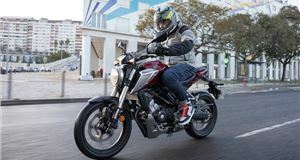 Look to the Honda CB500F and it makes the most of the A2 licence rules to come with 47PS, though you’ll pay £1000 more for the Honda than this Kawasaki. However, power is not everything and this is where the Z300 scores big. Kawasaki has very carefully transferred the style of its bigger supernaked bikes like the Z1000 to this much smaller class. Look at the 300 in isolation and it just looks like a proper naked machine ready to dish up the thrills. It’s only when you spot one next to its bigger brothers that you work out the Z300 is about 8/10 scale. Swing a leg over the 785mm high saddle and you find the dimensions work in your favour. 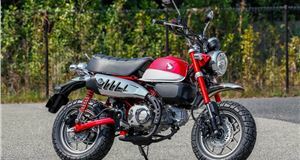 Yes, it’s a bit more compact but this is a bike aimed at town riders and commuters who want some weekend fun rather than an outright Sunday blast only toy. So, you have a comfortable riding position and wide bars that give excellent control at all speeds. Around town, those bars let you filter with consummate ease, although you do have to be wary of the mirrors as they’re at exactly the right height to clip car door mirrors as you pass. It’s not a big issue, just one you quickly assimilate into your riding style. On faster stretches, the broad tank and small side fairings keep the wind and weather off your legs and add to that sense of this being a full-size naked bike. No screen means you cop a bit of wind blast, but you could fit one if motorways form part of your regular routine. We’d also consider the optional tank and tail packs to give some luggage capacity if you don’t want to carry a rucksack. As for the rest of the rider’s environment, there isn’t much too it. The seat pad offers enough cushioning for longer journeys without any posterior aches and there are pillions pegs and small pad for a passenger. The analogue rev counter dominates the dash, with tell-tale lights either side and a digital display for speed, fuel and trip to the lower right. All are easy to read and you also get an Economical Riding Indicator to let you know when you’re getting the best fuel consumption from the bike. Make the most of that function and you should see 70mpg, but the Z300 is a lot of fun to ride, so we saw a more real world 57mpg. That gives a 200-mile range between fill-ups, which is ample for this class of bike. 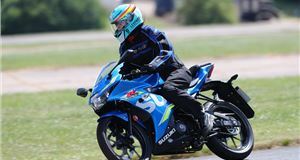 The reasons fuel economy took a dip during out time with the Z300 is simply because the 296cc parallel twin engine loves to rev. In true Kawasaki style, it feels a little flat until 4000rpm is registering and it’s only getting into its stride at 5000. Beyond that, it feels very perky and smooth throttle response means you can make the most of each of the six gears. In town, you can get away with using higher gears to avoid making too much noise, especially on the Performance version that comes with the Akrapovic exhaust as standard. Head on to open roads and the sound isn’t an issue as the motor makes a pleasingly sporty parp. Maximum power arrives at a vibration- free 11,000rpm and stays there until the red line at 13,000rpm, so you have a little leeway when stringing together some favourite back road bends. The handling is more than up to the job, even if the front forks look a little twig-like when you see the Z300 parked next to larger supernaked bikes. Not a problem when you’re enjoying the agility and smooth ride that feel very similar to Kawasaki’s bigger naked machines. To bring it all back to a safe halt, there’s a 290mm single front disc with two piston caliper and a 220mm rear disc. You can also order ABS for the Z300 and we’d absolutely recommend it as it adds only 2kg to the overall weight, making this the lightest anti-lock system on any two-wheeler. It’s effective and delivers good feel through the lever, too. 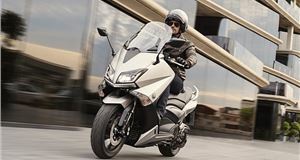 All of this combines to make the Z300 an impressively competent bike that anyone can use and enjoy, not just newer riders moving up when they gain their A2 licence. 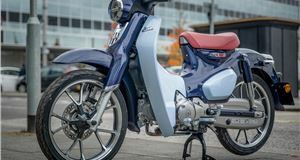 The performance, handing, build quality and fun factor all mean this pint-sized Zed is every bit as endearing as its larger sister models but without the bigger price tag. 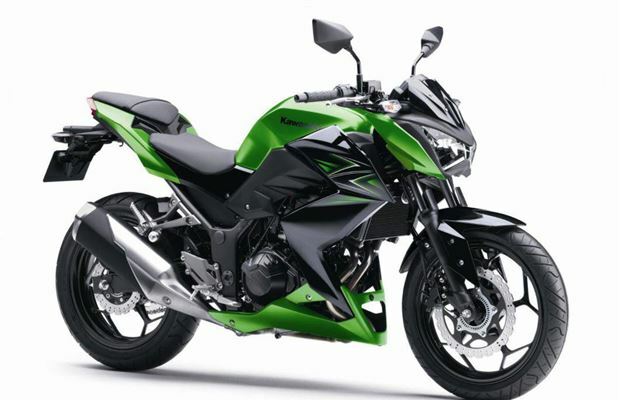 The Kawasaki Z300 is on sale now. Performance: Top speed 100mph (est). Fuel consumption 70.0mpg (est). VED £42.